A rich, floral accord of bluebells and hyacinth enhanced with notes of galbanum, rose and jasmine. This beautiful fizzy bath bomb heart is in a super large size for the most divine bathing experience that will leave you feeling touched by the angels. Pastel tones swirl into a deep heavenly blue to complete the experience. 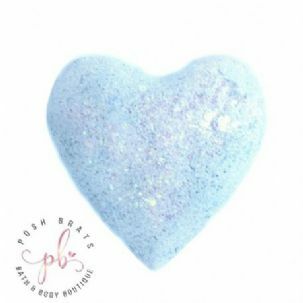 This beautiful fizzy bath bomb heart is in a super large size for the most divine bathing experience that will leave you feeling touched by the angels. Pastel tones swirl into a deep heavenly blue to complete the experience.